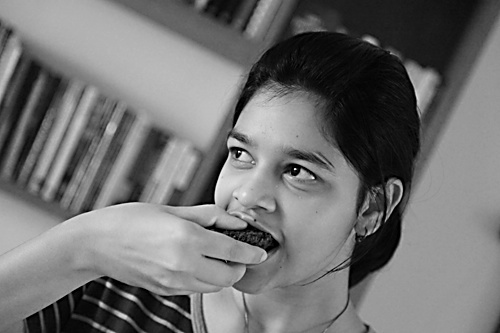 When my cousin Vedika kept raving about the homemade peanut butter she ate every morning for breakfast during a school excursion in a farm in the rustic parts of Pondicherry, I recalled the chocolate peanut muffins I had made a few weeks ago and thought “she loves chocolate and she loves peanut butter”, she will surely love my chocolate peanut muffins. 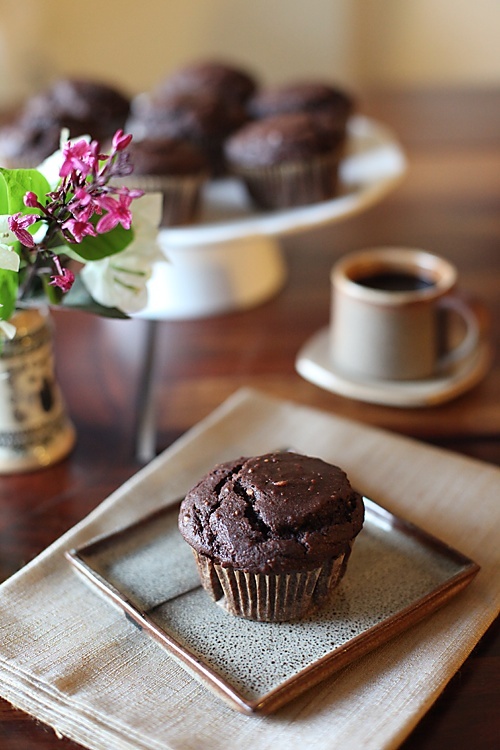 These muffins are so easy to make and have great texture and taste. Don’t be fooled by the fact that they are vegan and also without regular butter. Most bakers I come across are skeptical about trying eggless or vegan recipes. I harboured similar notions until they were dispelled after successful results. If the recipe is right and the ingredients are top quality then one can rarely go wrong, even in baking where precision and exact measurements are a must. The flavour combination of peanuts and chocolate is phenomenal and the taste of the peanuts lingers for some time. These are ideal for snacks and kids lunch boxes. 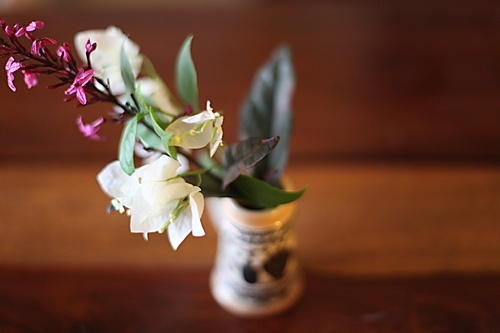 And these are perfect with your evening cuppa too. Or maybe even breakfast if you are having a bowl of cereals. 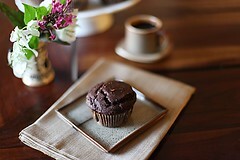 The best part of making these muffins for me was the happiness and smile on my sweet little sister’s face. I prefer making fresh peanut butter for these cupcakes. If you want to use ready made peanut butter then use 1/2 cup butter and 2 tbsp oil. In a skillet, on a moderate flame, roast the peanuts until golden brown. Alternatively heat an oven to 200 degrees C/ 400 degrees F and roast for about ten minutes or until they darken, shaking them a bit half way through so that they roast evenly. Allow the peanuts to cool a bit and then place them in a blender with the oil and fleur de sel and process until you get peanut butter. I like it chunky here and so I blend it until I get a smooth butter with chunks in it. 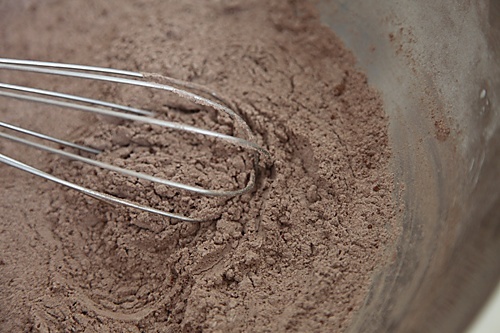 In a bowl, mix in the flour, cocoa powder, baking powder and baking soda and sieve once to make the mixture uniform. Put in the jaggery or sugar, vanilla extract, water and peanut butter and mix with a whisk or a wooden spoon until well blended. Heat your oven to 180 degrees C/ 350 degrees F. Place the batter into cupcake liners* and bake for 20 to 25 minutes or until a skewer or toothpick comes out clean. 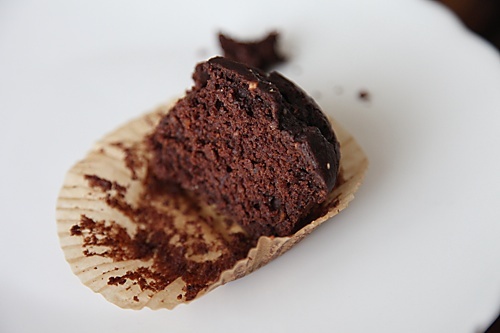 *You might want to use 2 cupcake liners to get neat edges after baking. I must admit I'm one of those people who is not very confident about a vegan recipe but you are making me believe! Anushruti I love pictures lately. Love the mood, love the focus. They look great. You're right about the began recipes but this definitely looks like an exception. Lucky sister too! Hey Anu…great recipe …am certainly going try this one over the weekend. Can I double the recipe for preparing more muffins & if that's possible then what would the quantity of baking pwd & soda be..We tried the Mango Cheese cake recipe substituting the mango with strawberry puree…it turned out really nice..
Vedika: Any time for you! El: I'm lucky too, to have her in my life. Arundati: You could easily double this recipe. Just double all the ingredients including the baking powder and soda and bake! It's great that you enjoyed the cheesecake and swapping the mango for the strawberries is wonderful in this season. Anna: Thanks. Can your son take in cashews or almonds? If yes, you could replace the peanuts with other nuts. If he can't take any nuts at all, then yes the recipe needs to be modified a great deal. Let me know if you want that too. Always love the combination of peanut butter and chocolate…in fact love peanut butter in any form. Recently had Cheezit Cheese and Peanut Butter Crackers on an international flight and i loved it…imagine two tiny coin sized crackers, one caated wth cheddar cheese and one with peanut butter,stuck together to melt in your mouth…cheesy, salty, sweet and everything thats explosive…WOW…Love the clicks. I was goin through this recipe and it really sounds nice. Can i make this in a normal baking tin instead of individual cups. My husband's b'day is coming so i want to make this for him and i want it cake like. I have found that vegan bakes are great for those who enjoy natural flavors of food. I make these two and can vouch that they taste awesome:)! hi Anushruti…i asked you abt baking this as a normal cake but got no response, anyway i did tk a chance a bake in a cake tin since i had no cup cake moulds. It turned out well but the center was a little sticky and how refused to become firm…is this cause i used a tin?? ?Plz plz reply…..cause the cake was yummy and i want to make it for another get together next week…. Manya: I'm sorry if I didn't respond to you earlier. I have not tried baking this whole, but from what you are telling me, I think you should increase you baking time by 10 to 15 minutes more for the cake to cook properly. Then you won't have a problem. shruti:I don;t use or recommend a microwave oven (pls refer my faq). Buy an OTG (bajaj or morphy richards) or a built in oven (siemens if your budget permits or kaff). can i mkae it in microwave with convection mode. I very much appreciate how you present recipes with ingredients full of natural goodness. Thank you for sharing these recipes with us. Hi Anushruti. I finally baked this as a cake by doubling the recipe. It was yummy.Thank you. The flavor of peanut butter combines well with cocoa. Thumbs up! One clarification. I felt that my cake was somewhat crumbly. I used equal parts of white sugar and jaggery. Could that be the reason? Or have I overbaked it? I would love to bake this cake again and hope you will reply. Jayashree: You could try this without cocoa powder too. Try using only jaggery the next time. 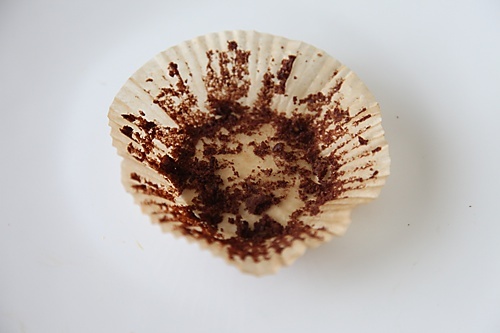 Over baking also can make a cupcake crumbly. Try baking it only for 20 minutes. I am a bit confused with the recipe instructions. I have ready made smooth peanut butter. When do I use the 2 TBS of oil? When mixing the wet ingredients? hey for this recipe can i use normal granulated sugar?? will it affect the muffins?? Daisy: Just mix in the oil into the butter. nishita: I use jaggery for this recipe. If you want to use granulated sugar then you could put it into the blender to powder it. I made these muffins today. Actually I baked them in the mini muffin tray. These are the best peanut butter muffins ever. So spongy and soft that they just melt in your mouth. Thank you very much for posting the recipe. Aruna: Glad to know that you enjoyed this recipe. I baked these today. They look great. A couple of concerns. The muffin isnt coming out clean from it s liner although it s baked. I used Demarara sugar in the same quantity that you ve mentioned. The muffin tastes very less sweet. What could I do? Megha: the quantity of sugar mentioned is 3/4th cup for 1 cup flour. Some may find this sweet as well. Feel free to use more sugar. If the batter is not mixed well or is under baked, the muffins tend to stick to the liner. Hope this helps. I like the above recipe, and wanted to know if I can replace peanut butter with, Nutella, which is a chocolate flavored hazelnut butter and readily available. If yes! Please, let me know the ingredient proportions as I'll not be using the cocoa too. devasena: I'm not sure if nutella, which comprises of hazelnuts, sugar, cocoa and oil would work to replace the peanut butter here. It will be like changing the entire recipe. 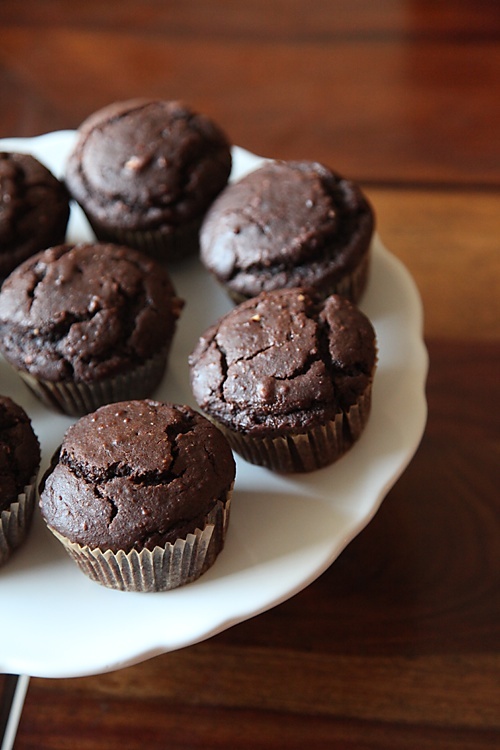 However, you can top the muffins with the nutella. Can I replace the maida with wheat flour ? Saranya- Yes you can. It might be a bit crumbly though. Hi. 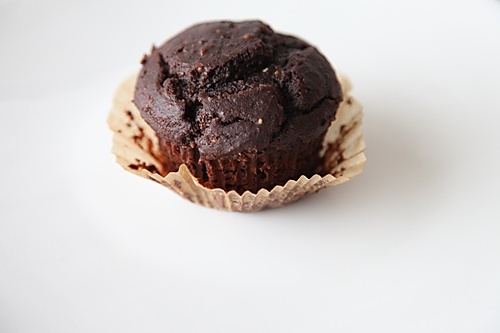 Could you please share the recipe of only chocolate muffin without any nuts. Thank you.